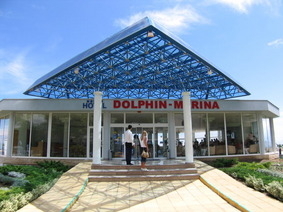 Location: Dolphin-Marina is a 4-star hotel in Grand Hotel Varna Resort. It is located on the beach and is perfect for your family summer holidays. Accomomdation: The four-storied hotel is newly built, and has a capacity of 430 beds in 131 double rooms, 32 family rooms and 20 suites. The hotel offers All Inclusive accommodation. All rooms in the hotel are elegantly furnished and equipped with air-conditioning, satellite television, telephone and safe-deposit box. An extra bed can be fitted in each room if needed. The bathrooms are equipped with bath tubes and the balcony offers magnificent sea view. Note: Imported alcoholic beverages and additional services such as laundry and telephone bills are not included in the price and should be paid according to the hotel price list. After 11 pm all food and beverages are paid according to the hotel price list.